You may have heard the news! We are taking our home based business to the next level this spring! 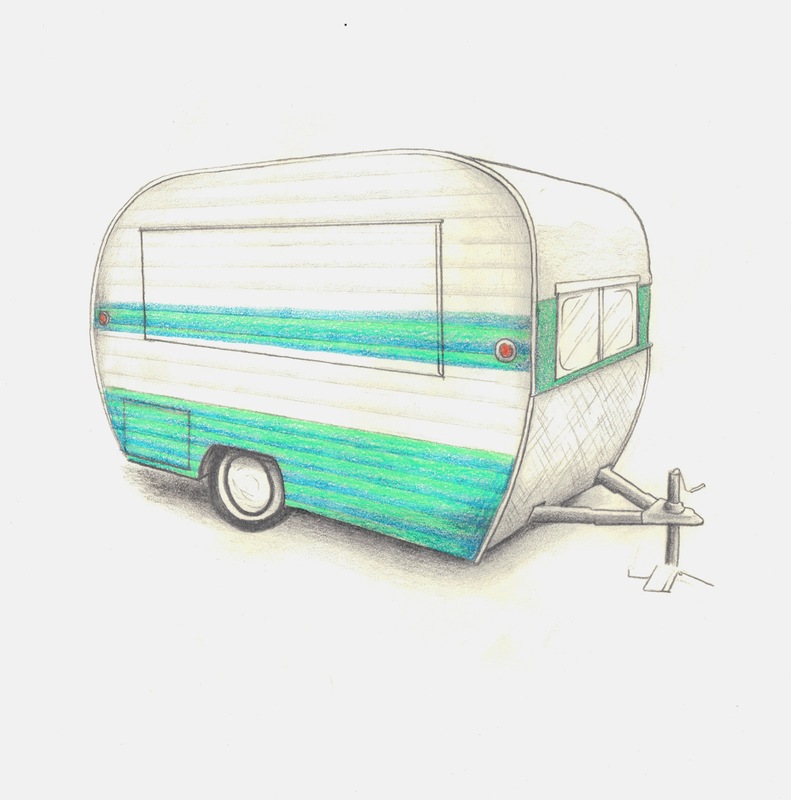 Meet Rosie (pictured below), our vintage inspired mobile bakery and the newest member of the Floured Apron family. Now we can share more of what we love with the community we love! We are so excited! In the meantime, we are trying to secure additional funding for the equipment we need. We hope you’ll consider helping us get Rosie to her full potential. Share it with EVERYONE and, most importantly, come see us this spring! Stay tuned for updates on Rosie’s progress and her grand introduction. Hello friends! I hope you had a wonderful Thanksgiving! November flew by for me and I can’t believe tomorrow marks the start of December! I filled many orders on Wednesday and spent Thursday morning at the Aurora Turkey Trot. Casey and Carrie participated in the Mashed Potato Mile and many others turned out for the 4 mile run. 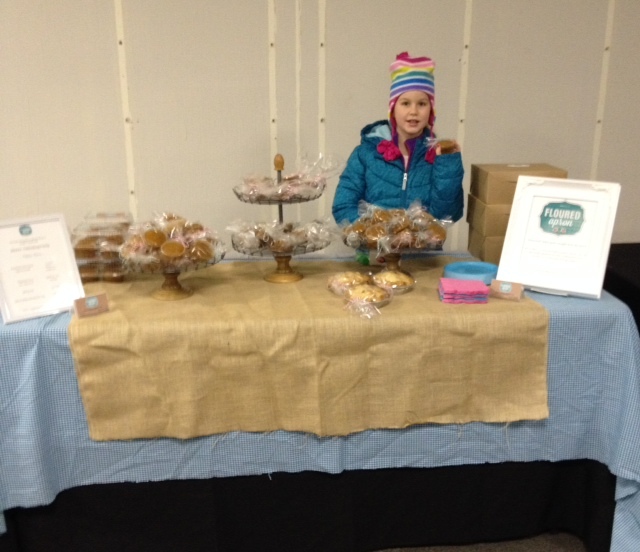 It was a beautiful, snowy morning and I was thrilled to have an opportunity to sell goodies at the event! This time last year, we were just settling into our house after a challenging move from Cincinnati to NE Ohio. I didn’t know which end of me was up! A year later, I’m happy to share this has been Floured Apron’s highest sales month ever! Woo hoo! I am touched by the tremendous support of people who have trusted me with their baking needs and many who have opened doors of opportunity. Thank you doesn’t seem like enough to express my gratitude. Honestly, I have considered giving up on this business many times, especially, since we moved. It has been challenging to start over and build a customer base in an area that was completely new to me. There have been many tears, confusion, frustration and several agonizing moments over business decisions. What keeps me going on this business venture? I think it’s a combination of meeting new people, making great friends and fulfilling my passion for baking. Countless supporters push me to be better and try harder. Thanks to them, the difficult moments pass and I get to keep doing what I truly love! Motivation comes in many forms. For me, it’s receiving phone calls or emails sharing positive feedback. It’s a wonderful feeling to know I’ve brought a little joy to someone’s life because that’s what sharing food is all about to me. It’s rewarding and fulfilling on so many levels! This year, I’ve been fortunate to be part of baby showers, bridal showers, birthdays, anniversaries, weddings, rehearsals, shopping events, small business events, baking classes, 4th of July festivities, Halloween parties, office parties, races and Thanksgiving. 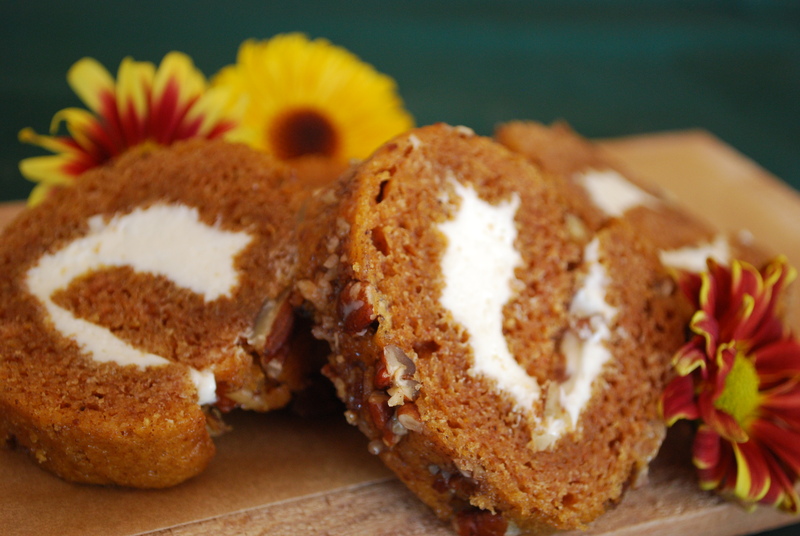 Countless pumpkin rolls, pies and cupcakes consumed my November and I couldn’t be happier! Thank you SO MUCH! I hope your support continues because we have amazing plans for Spring and I can’t wait to share all the details! I’m taking the pursuit of my dreams to the next level and I want all of you to be part of it. You’re going to LOVE what’s next! In the meantime, bring on December! I’m excited to spend time with my daughters baking our favorite holiday treats, decorating the house and simply hanging out! Enjoy this magical time of year with friends and family and thank you for all you do to make Floured Apron the best it can be! Things have been pretty exciting lately in my little Floured Apron world! 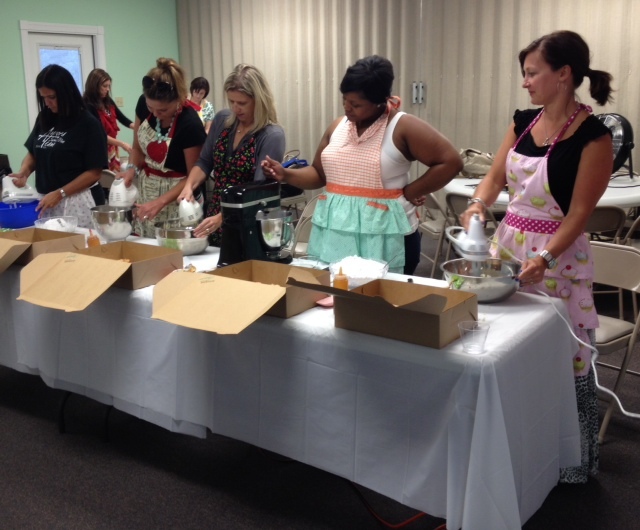 I conducted my first baking class and it was wonderful! The theme was “Falling for Cupcakes” and I featured my Pumpkin Patch and Caramel Apple cupcakes. This class was a dream come true for me because I’ve always wanted to share my passion for baking with others. The women who attended were fun, enthusiastic and so supportive. I can’t even explain how fulfilling and rewarding this was! 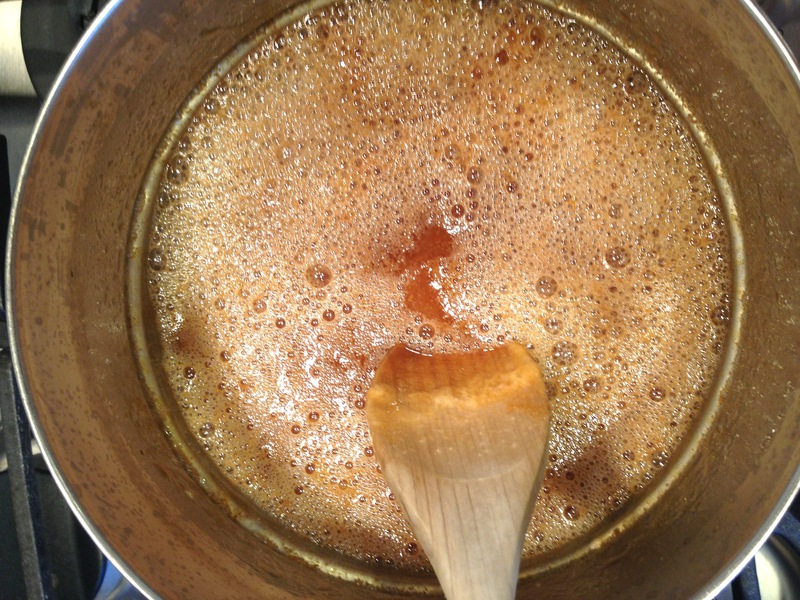 The prep for this class was the perfect opportunity for me to start my annual caramel making. As I was making it, I decided to snap some photos so I could share. 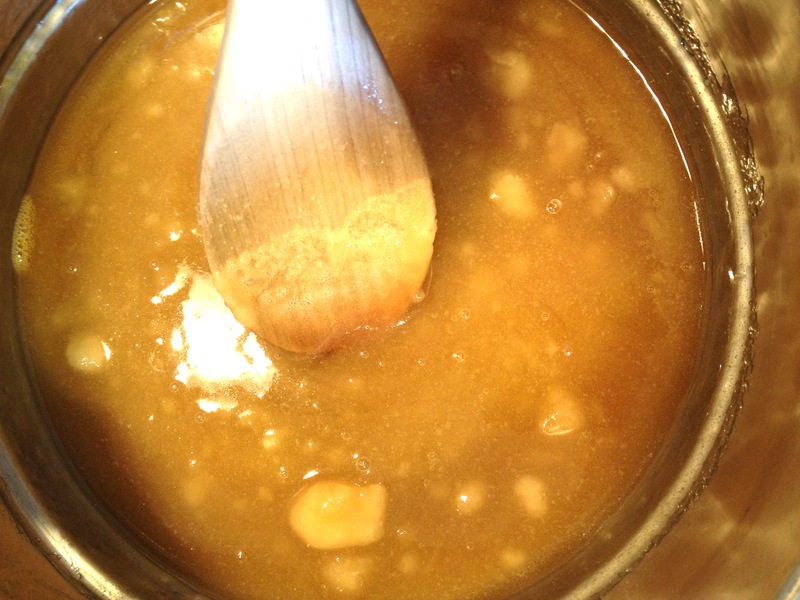 I remember the first time I tried making caramel. It was a disaster because I had no idea what I was doing. Now, I’m kind of addicted to the process and, of course, the final product! These pictures aren’t the best because I was trying to take them while I was making it but you’ll get the idea. 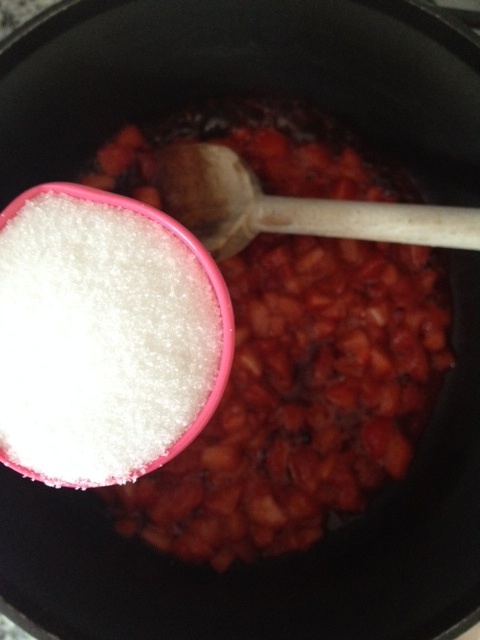 Start by heating the sugar and water in a pan on medium-high heat. Stir constantly! The sugar will burn (trust me). Keep stirring. 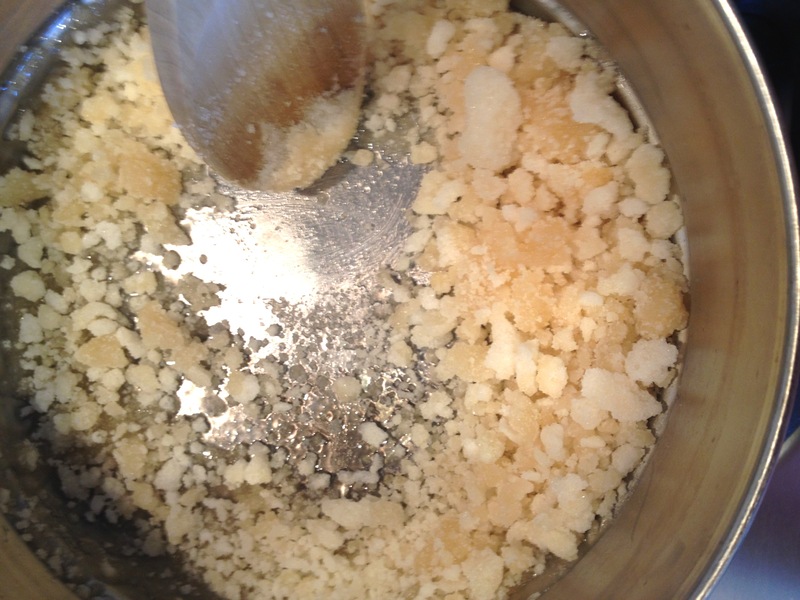 You will see some of the sugar begin to turn brown. Keep stirring. I promise it will liquefy! 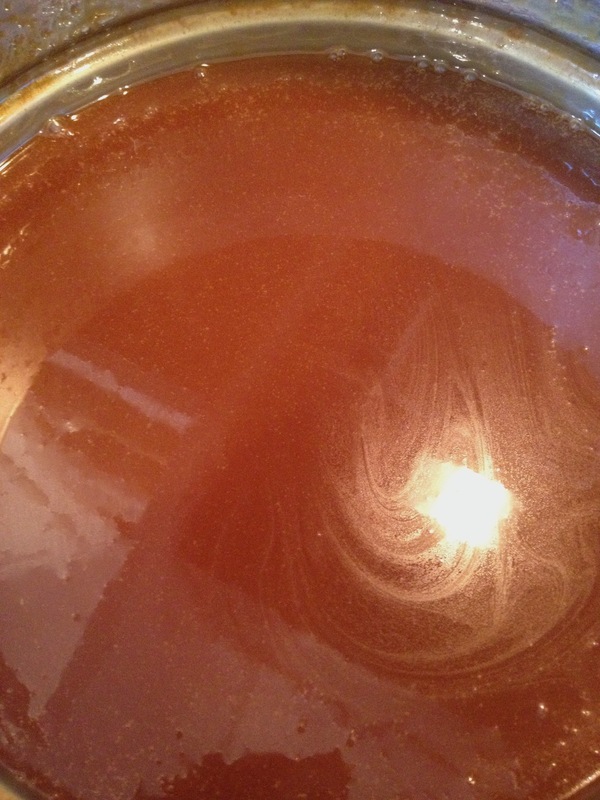 As the sugar dissolves, you will see it transform to a beautiful golden brown liquid. Keep stirring. 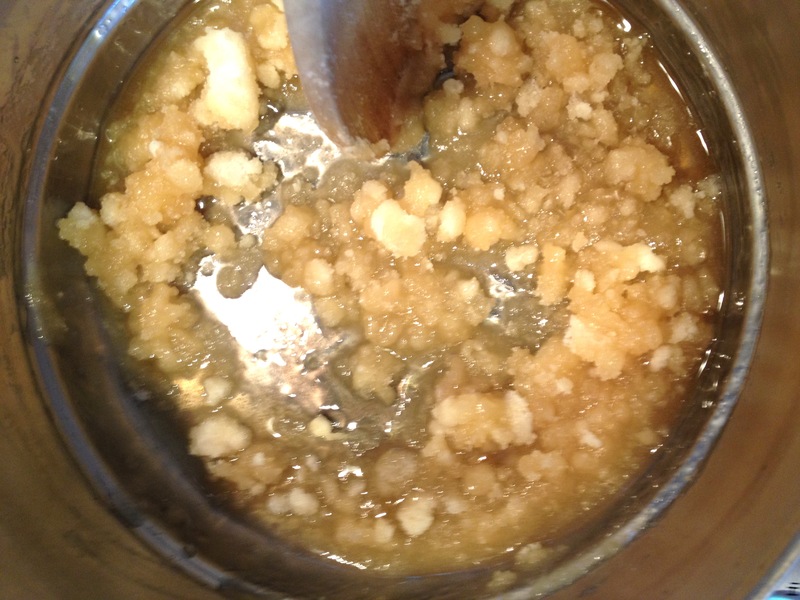 Once the sugar is dissolved, add butter and vanilla. Remove from heat and slowly whisk in heavy cream. Once the cream is whisked in and you have the gorgeous color, set aside to thicken for about 15 minutes then refrigerate. It is an absolute must to keep a small spoon near the pan, as it’s cooling, so you can test the temp. 🙂 YUM! I love to pour my cooled caramel into jars. They make great gifts and I keep plenty on hand this time of year so I can make Caramel Apple Cupcakes whenever the urge strikes (which is pretty often). I also like to eat a spoonful every time I open the fridge. It’s fall, right? I gotta do it! Look at this cute jar full of deliciousness. 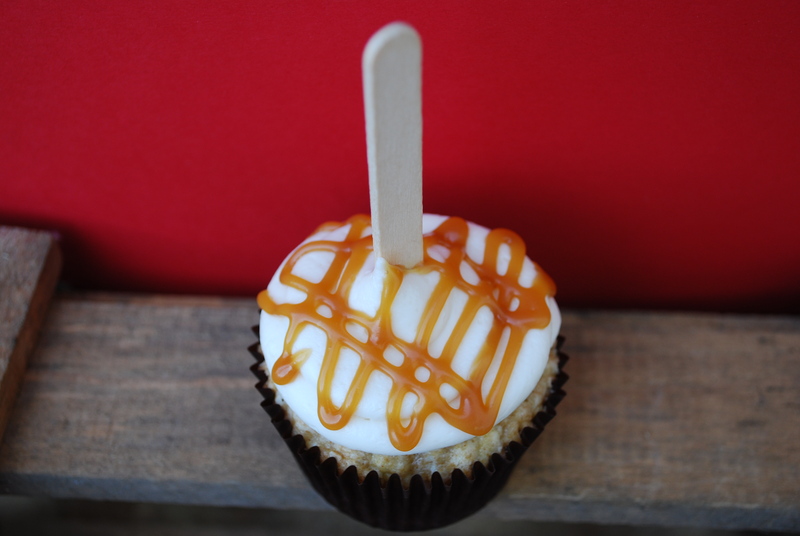 One of the best things about having homemade caramel around is our Caramel Apple Cupcakes! These cupcakes are the perfect combination of everything fall…cinnamon, apples and caramel. They are a mouthful of gooey goodness! When you finish eating one, you are a sticky mess and it’s wonderful! Did I mention these are filled with caramel? I could just drink caramel so the more the better for these little beauties! Caramel Apple Cupcakes are available to order now. Please contact us if you want some for your fall festivities! 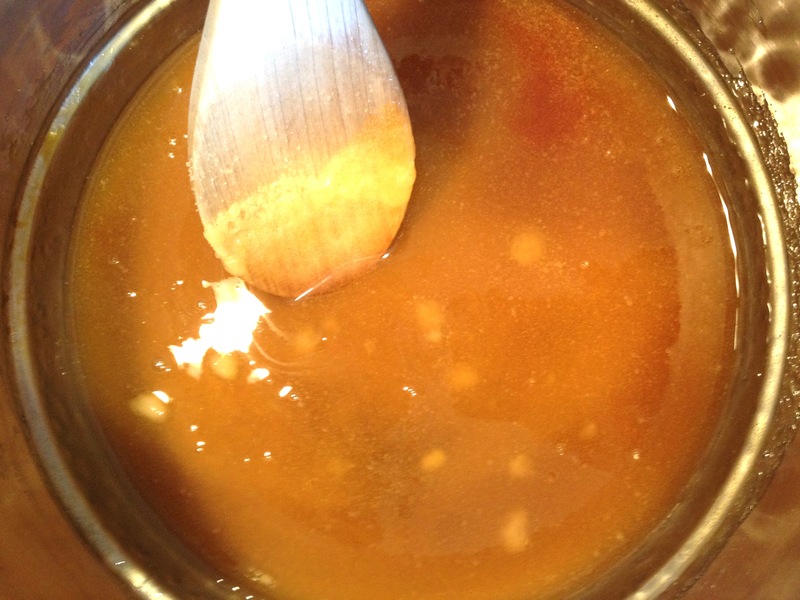 Here is the full recipe for the caramel. 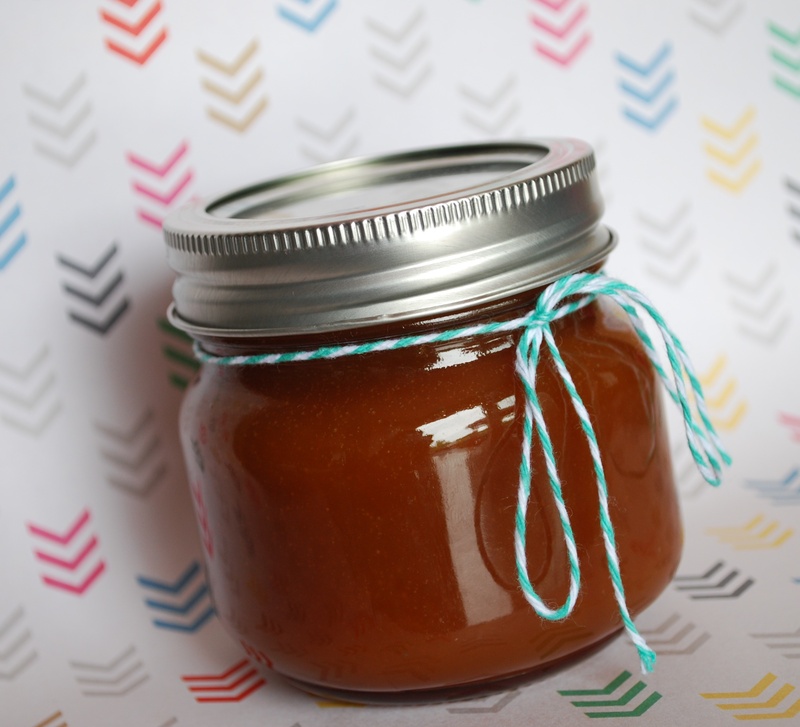 I’m going apple picking next week and I can’t wait to make more caramel and apple concoctions! I’m on a pumpkin kick too, but that’s another post! Yay for fall! Pour the sugar and water into a large sauce-pan. Heat on medium-high heat and stir constantly until the sugar completely liquefies. 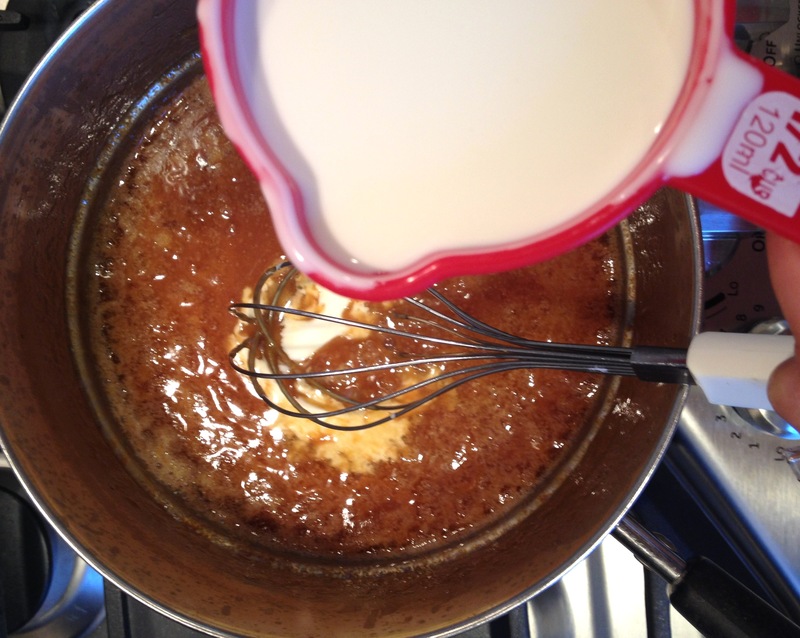 After sugar has dissolved, add the butter and vanilla extract to the saucepan and mix thoroughly. 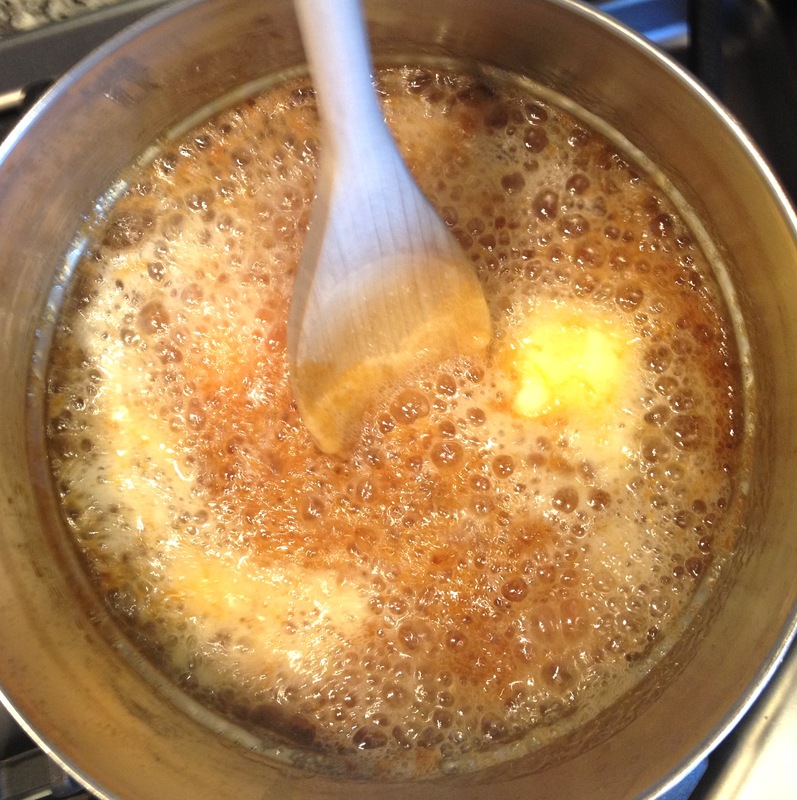 Once the butter has melted and the butter and sugar are completely mixed, remove from heat and using a whisk, slowly whisk in the heavy cream until you reach a beautiful golden brown caramel color. Set aside and let cool and thicken for 15 minutes at room temp. Refrigerate for 20 minutes to thicken further before using. Things have been a little hectic in our house lately as both my daughters started school this week. I’m sure many of you are facing the same brutal reality that summer break is coming to an end. Hannah and I hit the road Tuesday to move her into her dorm room. She is happily embarking on year 2 of college and I couldn’t be more proud (and kind of sad because I miss having her around)! I made the 9 hour drive back home on Wednesday and Carrie started third grade Thursday. Our school district has different buildings for different grade levels. Last year, Carrie was in a building that was first and second grades. 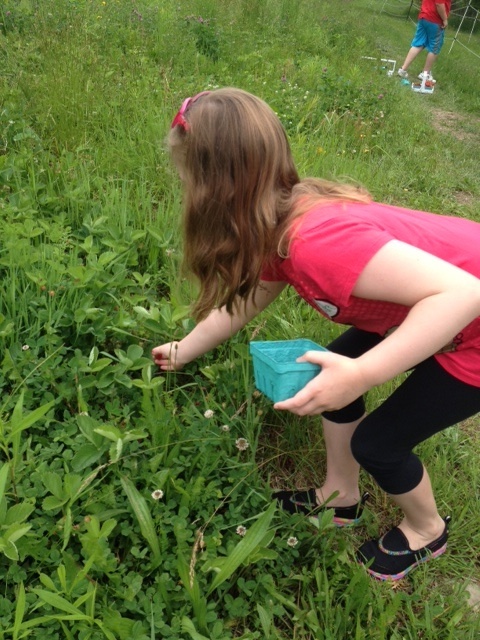 This year, she switched to a much larger school for grades 3, 4 and 5. She was really excited and popped right up out of bed, ate breakfast and we were out the door no problem. When we got to school and she saw all the other kids, she seemed a little nervous (4th and 5th graders can be intimidating). Of course, she had a fantastic day, loves her new teachers and saw many of her friends! My sweet girl is growing up way too fast! To help ease the transition from summer break to school days, I thought I’d surprise her with one of her favorite dishes for dinner and really celebrate her first day of third grade. 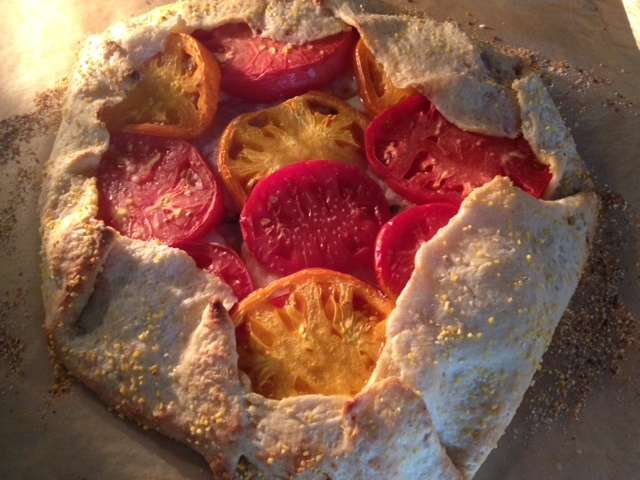 I’ve made this Rustic Tomato Tart a couple times this summer. As a matter of fact, this is Carrie’s request for her birthday dinner every July. 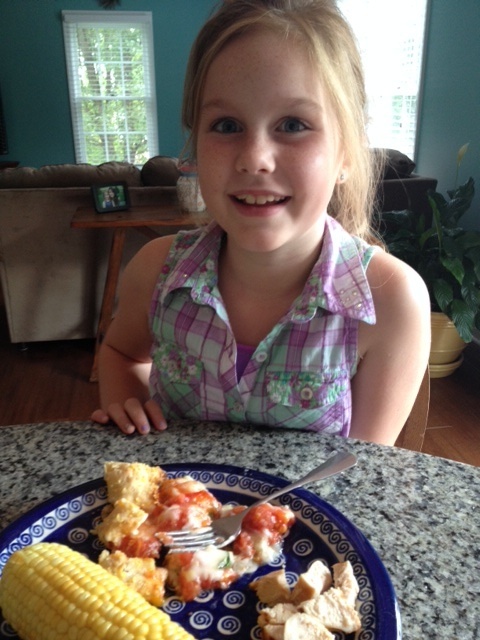 I snagged some gorgeous tomatoes from a farm stand in North Carolina on Wednesday and couldn’t wait to top off Carrie’s first day of school with a delicious summertime dinner! As I started preparing the dough, it dawned on me that I could share this with everyone. I came across this recipe in Cooking Light several years ago and it has been a dish my family looks forward to every summer. It’s not fancy but it is so yummy! The preparation includes several steps but they are not hard and totally worth it; all that’s required is a little patience. I didn’t capture photos of the dough making because I thought about posting it after I finished that part. 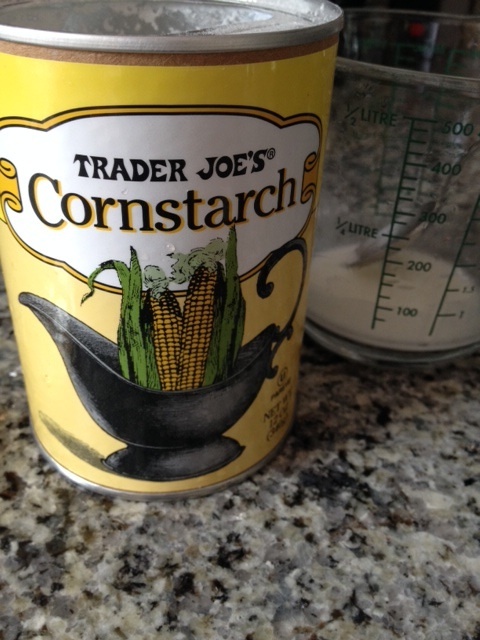 The dough calls for fresh corn kernels (I just cut them right off the cob), a little lemon juice and sour cream. I toss all that into my little magic bullet to blend then add them to the flour, cornmeal, butter and salt. I use my hands to make the dough then roll it out between sheets of plastic wrap. I then put the rolled out piece of dough on a flat cookie sheet and stick it in the freezer until I’m ready to assemble. 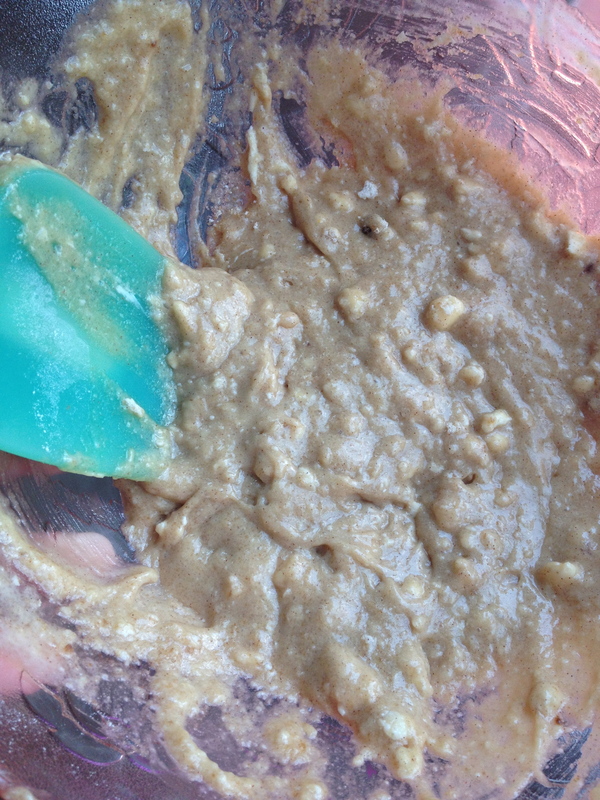 Today I made the dough early and left it in the freezer for a few hours. It works like a charm and makes dinner prep much easier to do this step ahead of time. 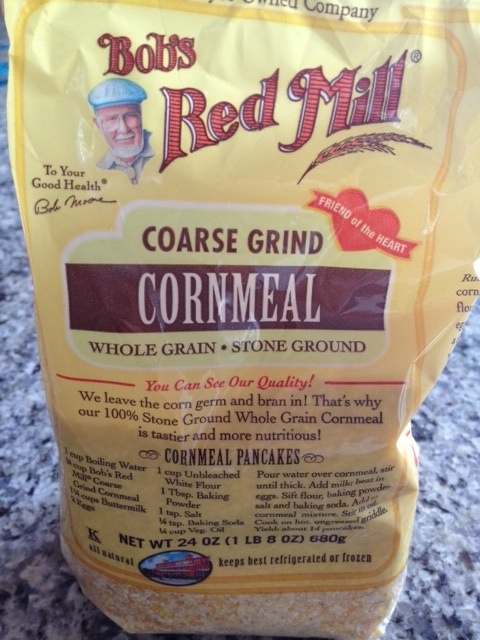 My tip on cornmeal is to use coarse grind. It gives the dough a nice little crunch and I love it so much more than regular cornmeal in this recipe. If you are already thinking this recipe sounds too complicated, stick with it! This tart is scrumptious and, once you try it, you’ll be looking for every reason to make it again. I sliced the tomatoes then placed them on paper towels and salted them. The salt draws out some of the moisture. 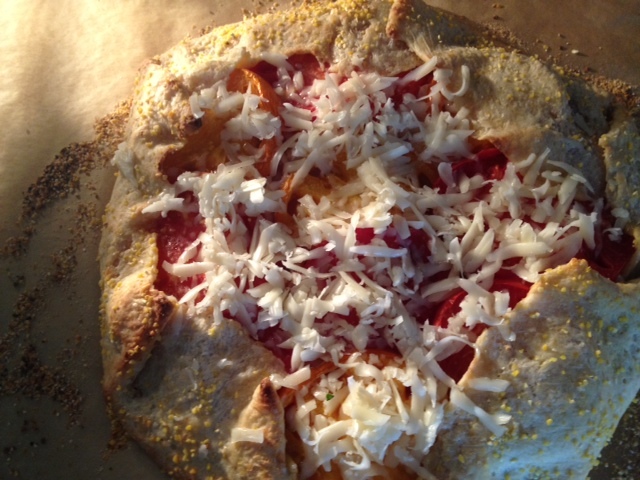 Then I grated the cheese, grabbed the dough, preheated the oven and started putting the whole thing together. Those are some good-looking tomatoes, huh? I like to use a combination but you can use whatever kind you have on hand. Once I remove the plastic wrap from one side of the dough (it’s much easier to remove while the dough is frozen), I flip it onto a piece of parchment paper that is covered with the cornmeal. 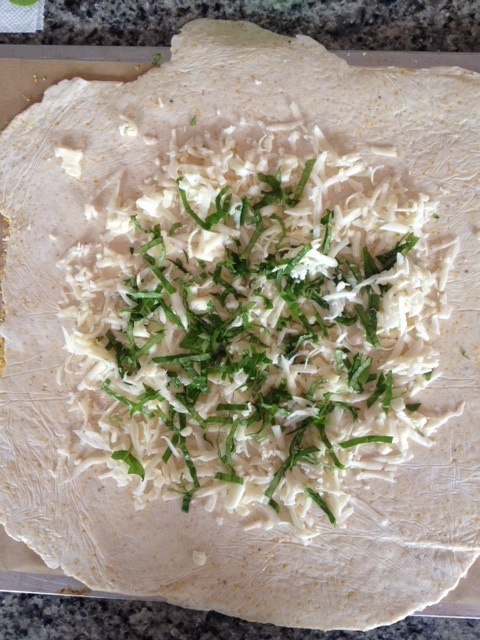 Next, I remove the other pieces of plastic wrap and start with the first layer of fontina cheese, fresh basil and flour. The scissors pictured here are amazing! They are herb scissors and they make life so easy! 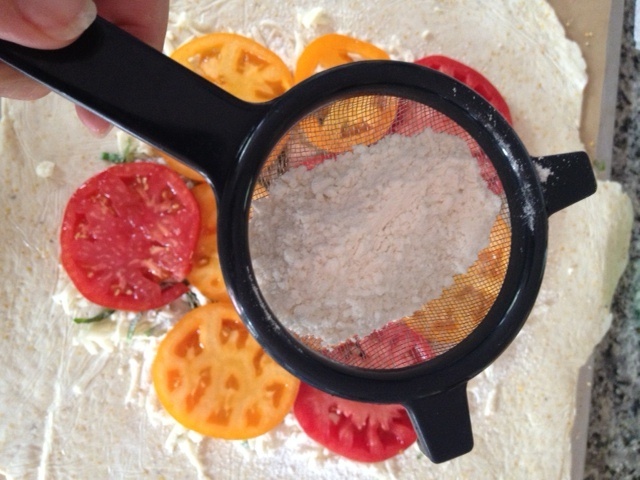 The flour gets sifted over the cheese to keep the crust from getting too soggy from those juicy tomatoes. Here come the tomatoes! Just one layer for now and leave a little dough border. Beautiful! One more sprinkle of flour then another layer of tomatoes. This part is fun and where the term “rustic” comes in. 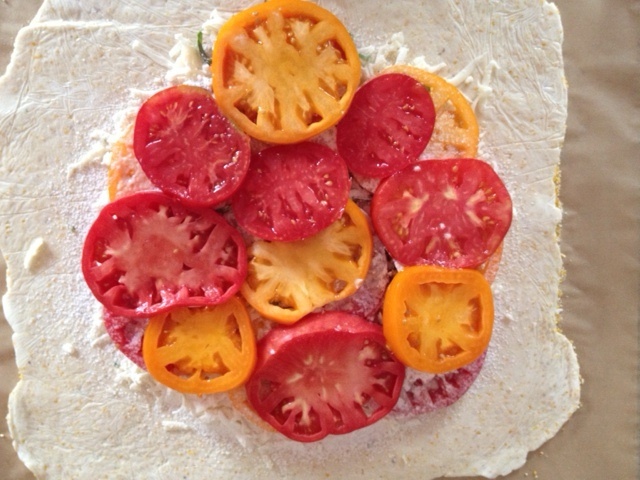 Simply fold the dough around the tomatoes. See the flecks of cornmeal? You’re going to love the crunch! Pop it in the oven for about 30-35 minutes. 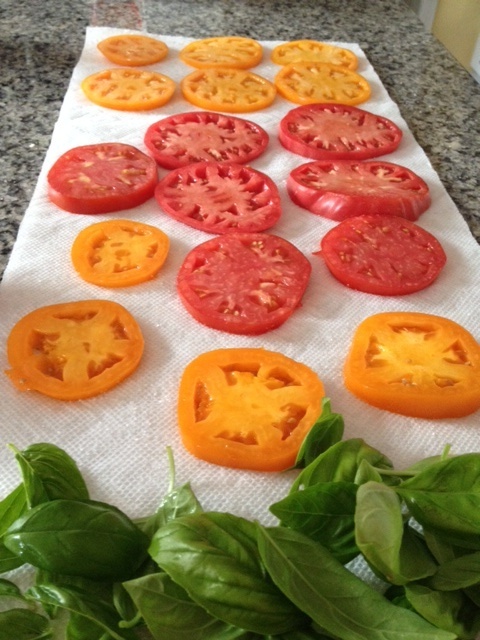 It will be golden brown and the tomatoes will be cooked. I like to sprinkle more cheese (yep) on top and let it melt for a few minutes at the end. 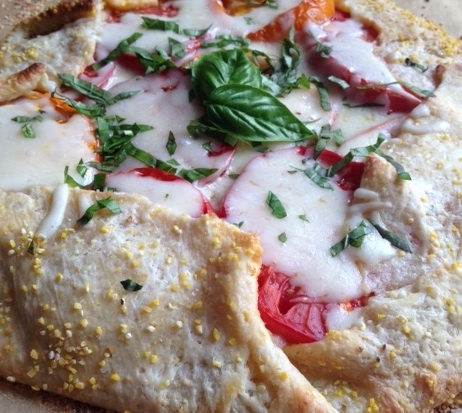 Once I take it out of the oven, I top it with more fresh basil. It looks pretty and, truth be told, I could eat basil 24/7 when it’s tomato season! MORE BASIL! There you have it! It’s fresh, healthy and delicious! Carrie LOVES this dish! Please don’t be intimidated by the numerous steps. Once you make it a couple times, you’ll find it’s really simple. Besides, you can’t mess it up because it’s rustic! 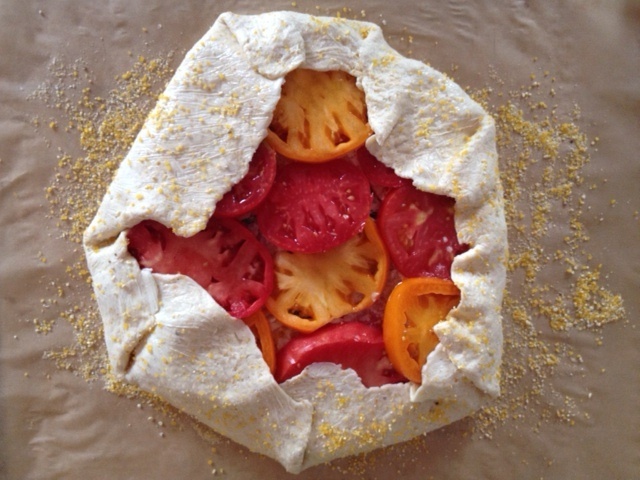 Find something to celebrate this weekend and make this before all the tomatoes are gone. Let me know how it turns out! Here’s the full recipe from Cooking Light. Again, I usually make the dough ahead of time. Slightly overlap 2 (16-inch) sheets of plastic wrap (or parchment paper or wax paper) on a slightly damp surface. 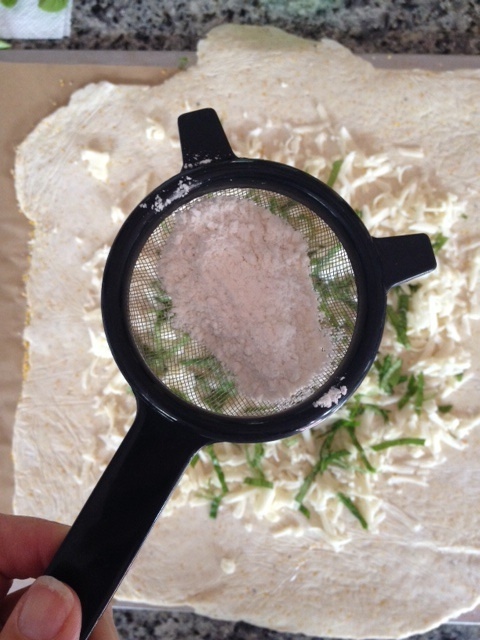 Place dough on plastic wrap; press into a 6-inch circle. Cover with 2 additional (16-inch) sheets of overlapping plastic wrap. Roll dough, still covered, into a 14-inch circle; place on a large baking sheet in freezer 10 minutes or until plastic wrap can be easily removed. Line baking sheet with parchment paper; sprinkle paper with 1 tablespoon cornmeal. Remove 2 sheets of plastic wrap from dough. Place dough, plastic wrap side up, on baking sheet. Remove top sheets of plastic wrap. Combine 2 tablespoons flour and 1/2 teaspoon salt. 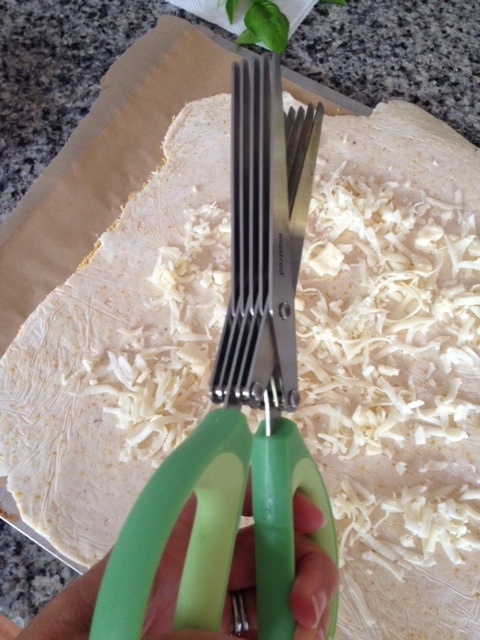 Arrange half the cheese on dough, leaving a 1 1/2-inch border. Top with basil. 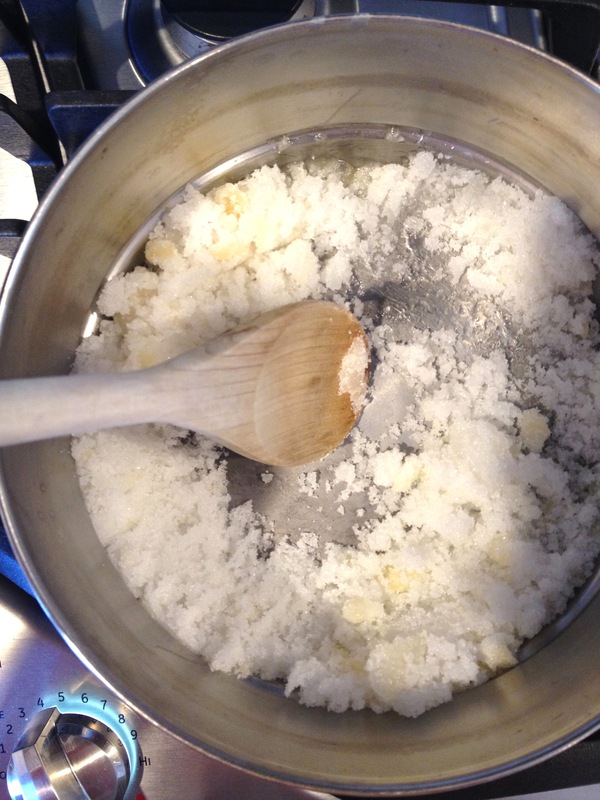 Using a sifter or sieve, sift 1 tablespoon flour mixture over cheese mixture. Arrange half of tomatoes over cheese mixture. 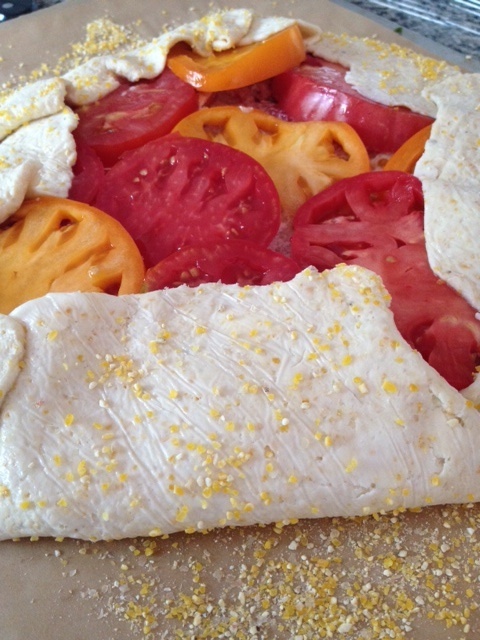 Sift remaining flour mixture over tomatoes; top with remaining tomatoes. 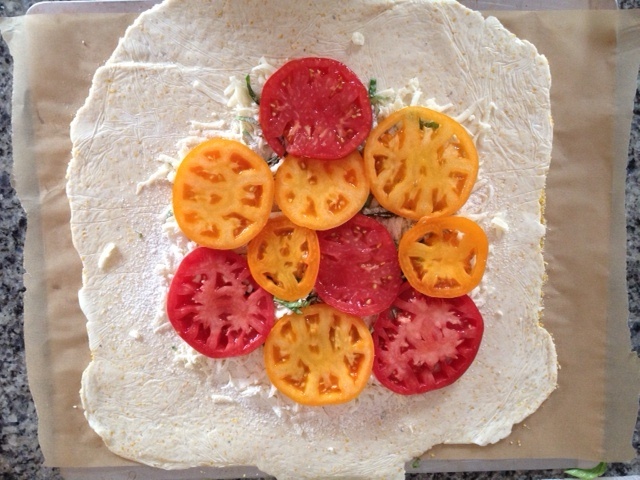 Fold edges of dough toward center; press to seal (dough will only partially cover tomatoes). 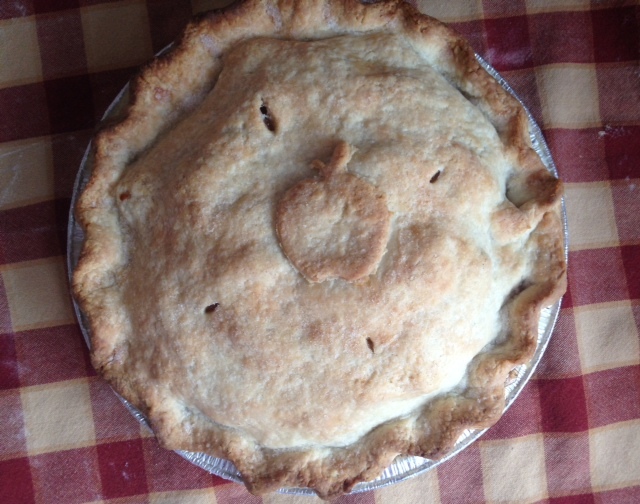 Bake at 400° for 35 minutes or until crust is brown; let stand 10 minutes. Sprinkle with remaining cheese and bake until cheese is melted. Remove from oven and top with fresh basil and pepper. Happy end of July friends! WOW! I can’t believe it is almost August! July is one of my favorite months. Most importantly, it’s the month we celebrate Carrie’s birthday (she just turned 8)! It’s usually the month when summer feels like summer. Flowers are everywhere, pools are full of adults and kids splashing, local veggies are delicious and evenings are full of fireflies, games and s’mores. This summer has been a little cooler than I hoped but that hasn’t stopped me from enjoying most of the things summer has to offer. 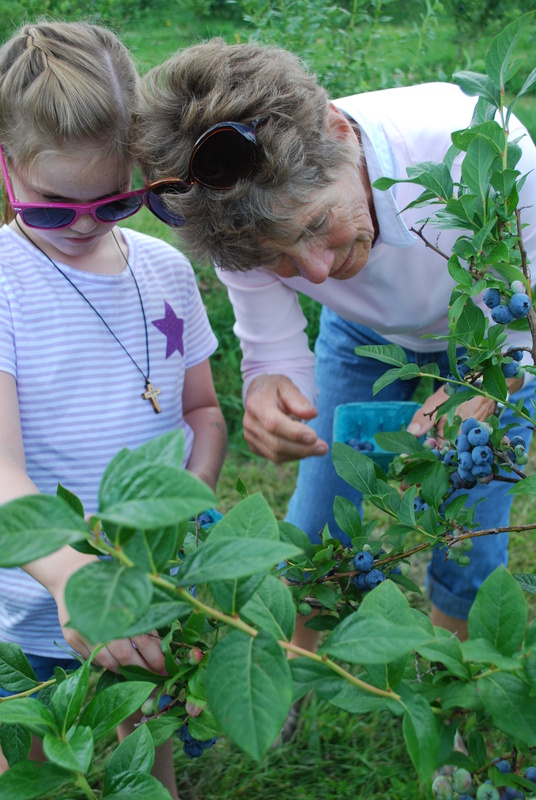 My mother-in-law came for a visit and I thought it would be fun to take her blueberry picking. 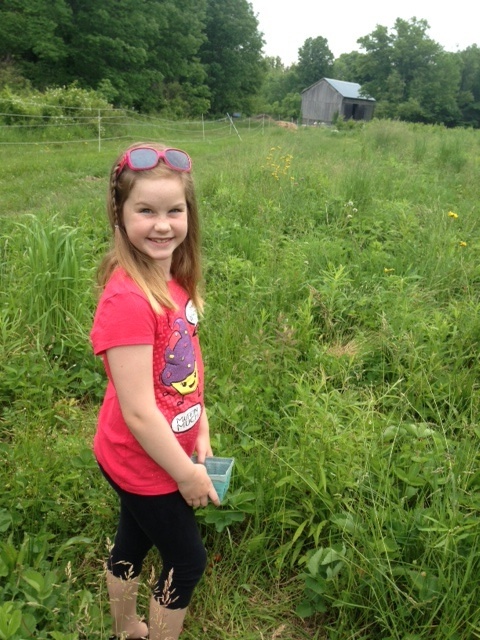 She and my father-in-law have a beautiful cabin in Minnesota where they pick wild blueberries every July. 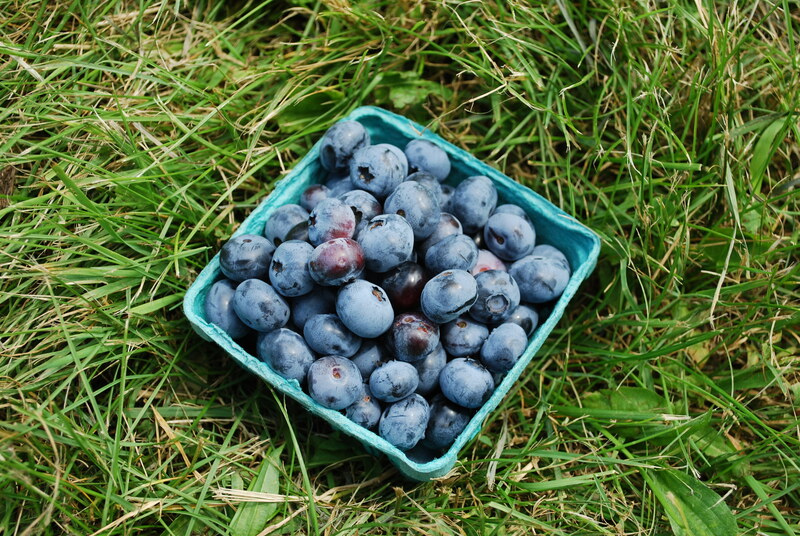 As a matter of fact, there is a Blueberry Fest held each year in nearby Ely, MN. I couldn’t wait to get to the farm! 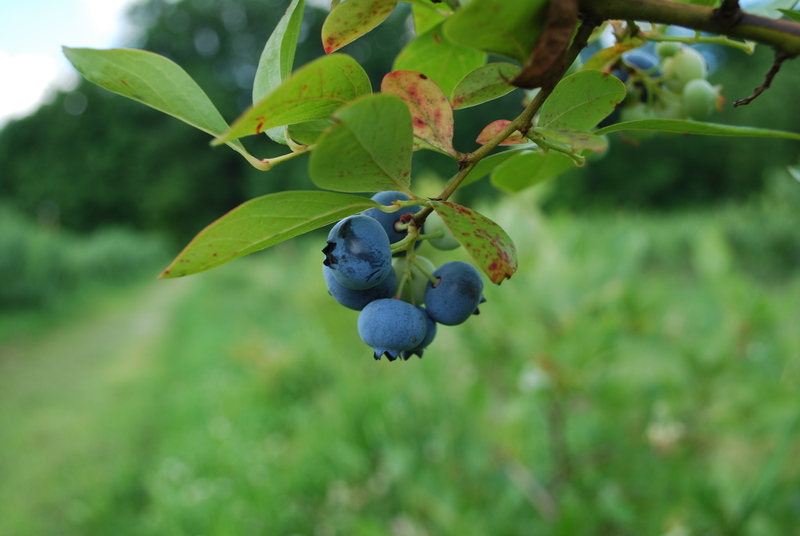 The blueberry bushes did not disappoint and before we knew it, we had tons of blueberries! 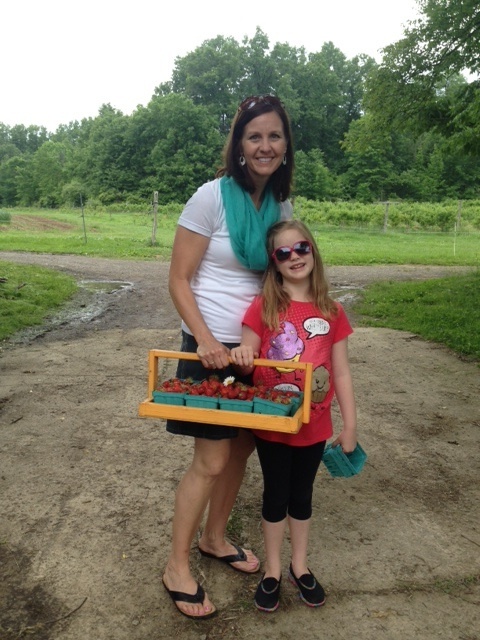 Carrie was just as excited to pick blueberries as she was strawberries (maybe a little more since Granny was there) and we had a great afternoon! We ate lots of them while we picked and all I could think about was making one of our family favorites, Blueberry Cake. 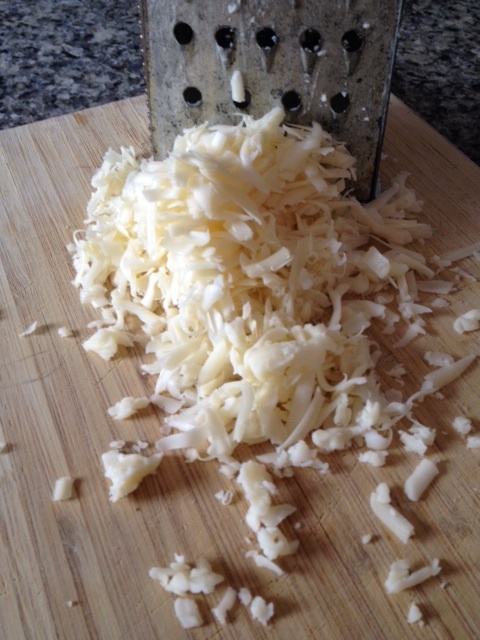 The recipe is from The Chopping Block located in Chicago. My sister-in-law took me for a cooking class just before my wedding in 2004. 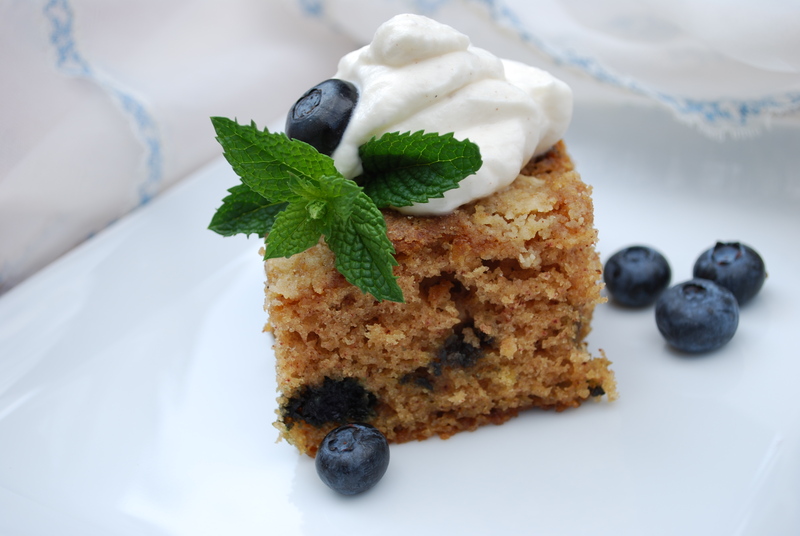 It was there I first had this cake and it has been a staple in my recipe book ever since! I’ve made this many times and it always turns out perfectly. This time I used only blueberries but have prepared it with both blueberries and fresh peaches, a super yummy combo! Add fresh peaches to anything and I’m there! Here’s how to make this simple, not too sweet, delightful little cake. I’m including the recipe at the end so please let me know if you try it and how you like it. 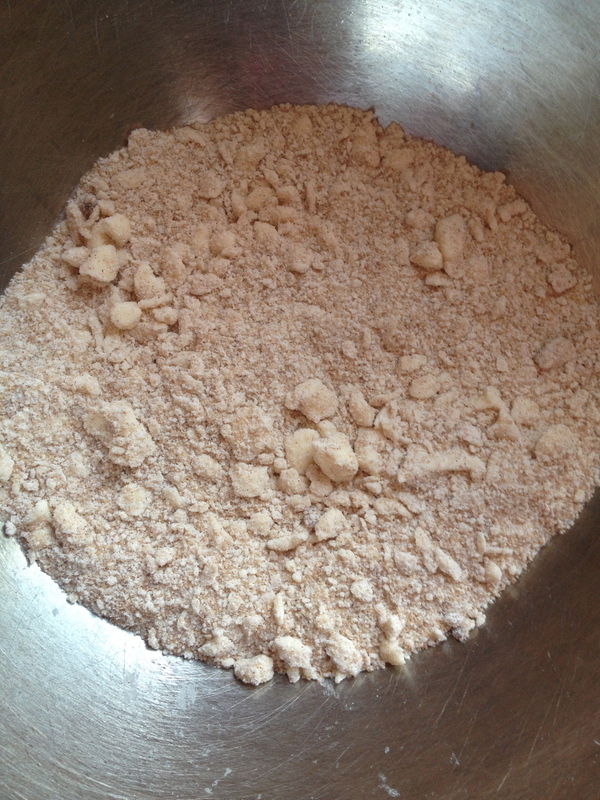 It all starts with dry ingredients: flour, dark brown sugar, white sugar, cinnamon and salt; cut in butter. 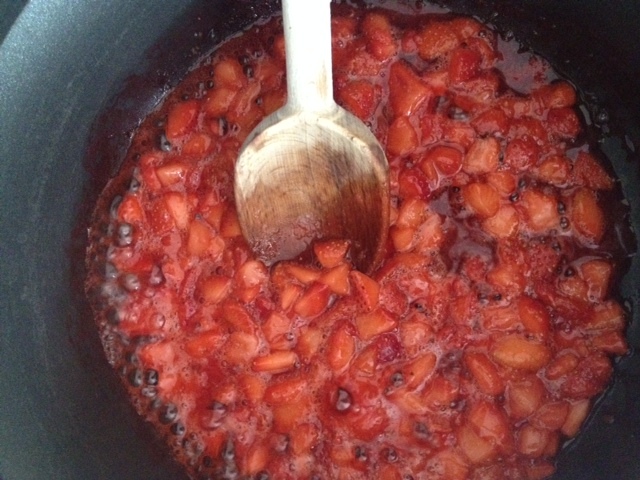 Top the berry layer with the remaining wet batter then sprinkle the remaining dry crumbs on top and bake…EASY! I have served this cake many times with cinnamon ice cream along side. I know, right? I didn’t have any on hand so I made fresh whipped cream and added cinnamon. Oh, the sacrifices I make. Ummmmmm, y’all know about my love affair with whipped cream! The cinnamon made it extra special and, well, you have to try it! This cake is a scrumptious dessert and would be out of this world spectacular served for breakfast or brunch. 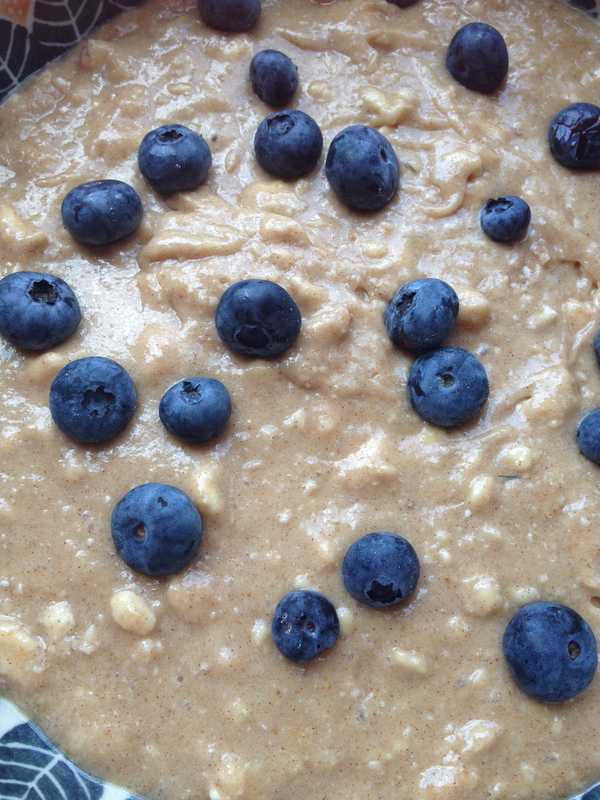 After all, it’s loaded with healthy, antioxidant rich blueberries. It would be a tasty treat on a picnic. The possibilities are endless. It’s not fancy and that’s what makes it so delicious! Bake this cake…you won’t be sorry! Stir together the flour, sugars, cinnamon and salt and cut in the butter with a pastry blender or two knives until crumbly. Set aside about 1/3 of these crumbs in a separate bowl. 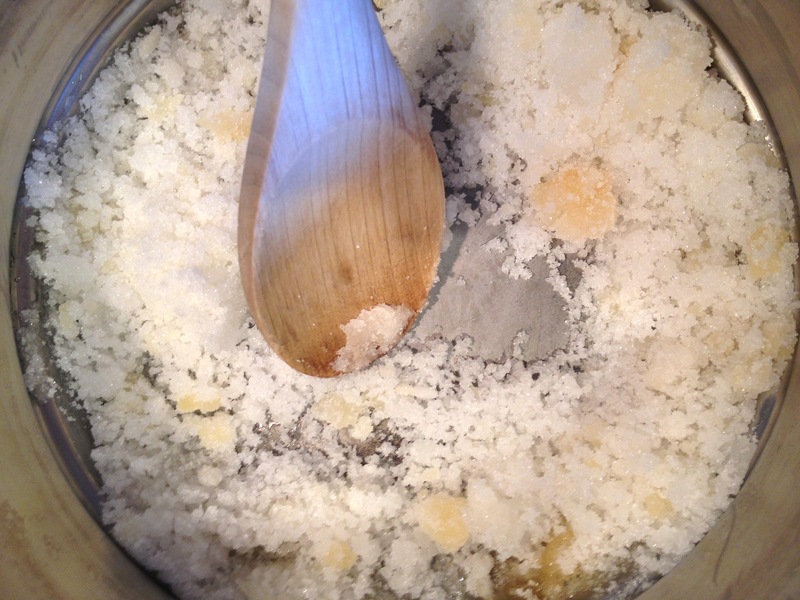 Add the baking soda, buttermilk and egg to the other crumbs and combine well. 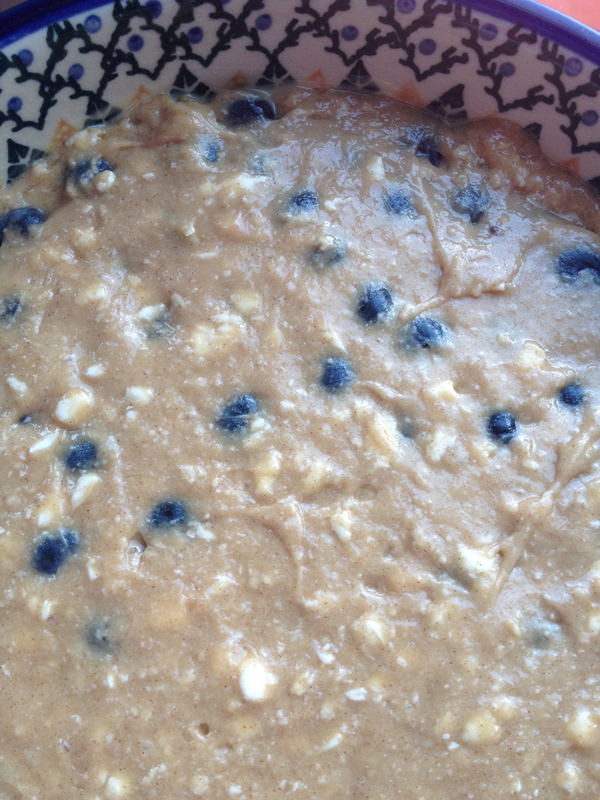 Place half of this batter into your baking dish. 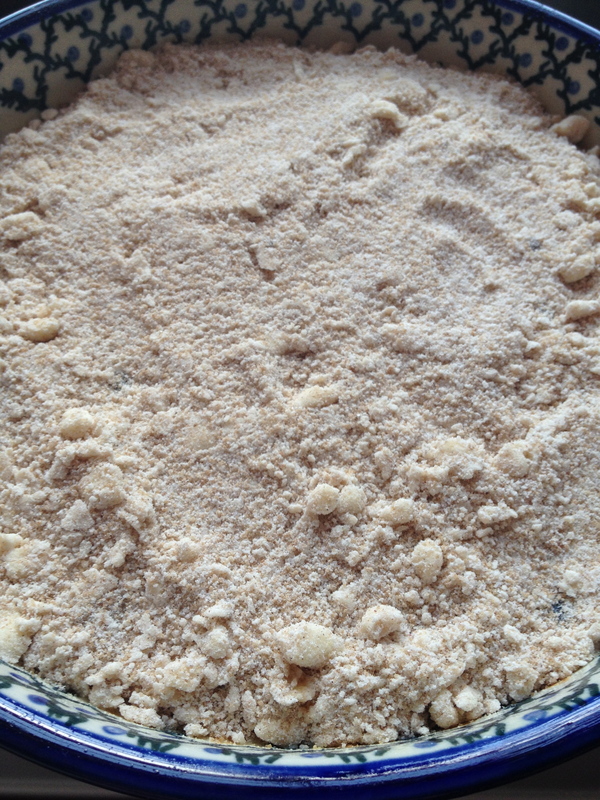 Sprinkle the berries on top of the batter then top with the rest of the batter and top with the reserved dry crumbs. Bake until firm and golden, about 35-45 minutes. Serve warm or room temperature with ice cream or whipped cream. Hello friends! I hope you are getting a nice dose of warmer weather and starting to enjoy these early days of summer. My oldest daughter, Hannah, finished her first year away at college and is home for the next couple months. 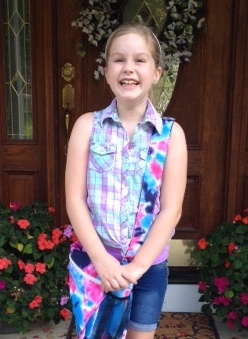 My seven year old, Carrie, wrapped up second grade a week ago. It is wonderful to have my girls together and I am soaking in all the sounds of sister giggles! As you may remember, we moved from Cincinnati to Aurora, OH (near Cleveland) last Fall. Last summer was a whirlwind so we decided to keep this summer simple and trade in a big vacation to explore our new area. We are close to Lake Erie and the Cleveland Metroparks system is amazing. There are several farming communities just a hop, skip and a jump away. 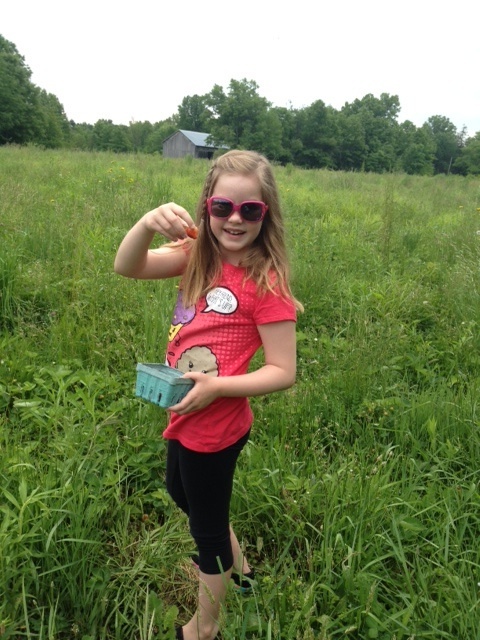 I love to visit local farms! I have a list of several to check out and hope to meet many of these amazing women and men at upcoming farmer’s markets. Hannah is out of town this week and, after three very unsuccessful attempts at making French Macarons, I was ready to get out of the kitchen yesterday. I had a morning meeting then Casey, Carrie and I hit the road for Peninsula, OH. We didn’t have a specific plan but knew there were some local shops and farms in the area. As we were driving around, we saw a sign for Greenfield Berry Farm. 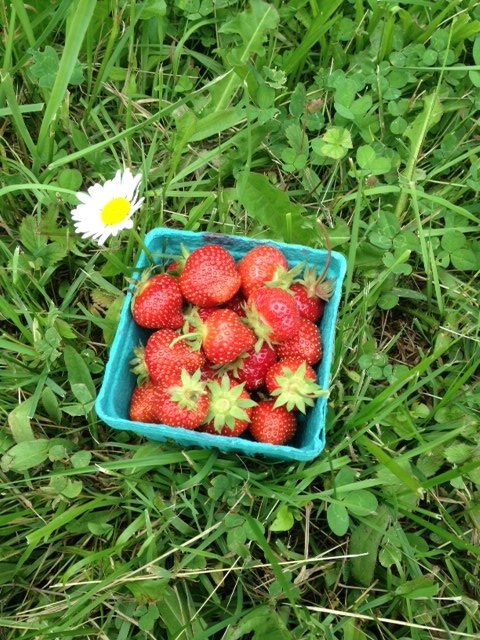 We pulled in and met a young man who told us to walk toward the barn and we’d find what we need to pick our own strawberries. 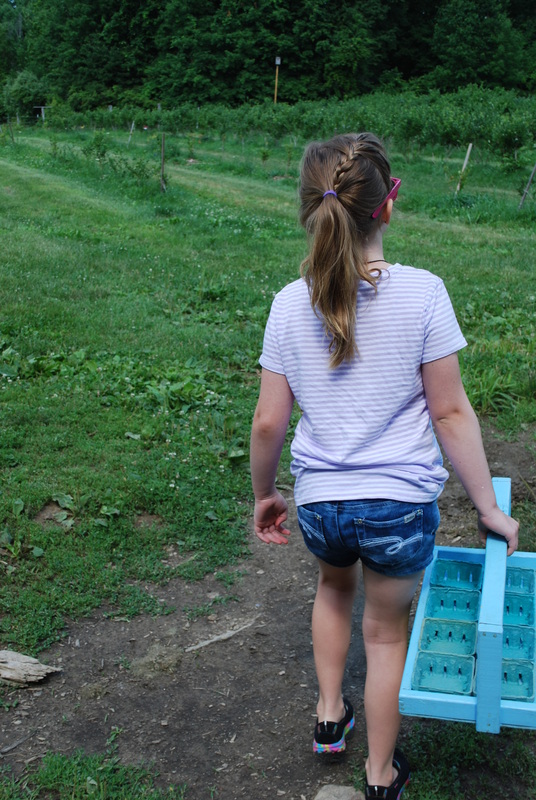 We raced to the barn, picked up our pint boxes and headed to the field to start picking. 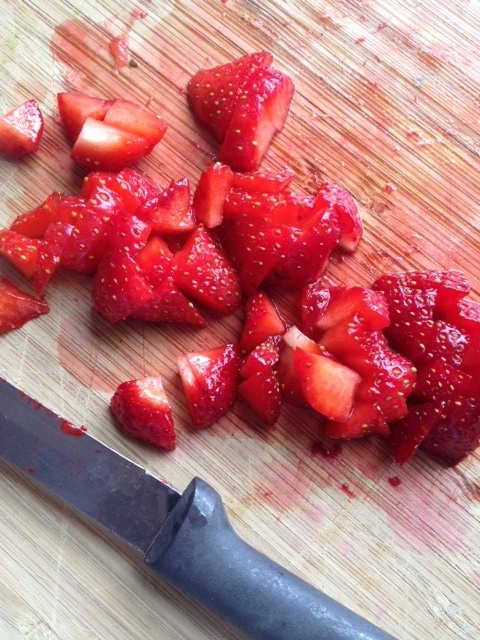 Of course there’s nothing new about strawberries. I’ve bought fresh strawberries from stands many times. 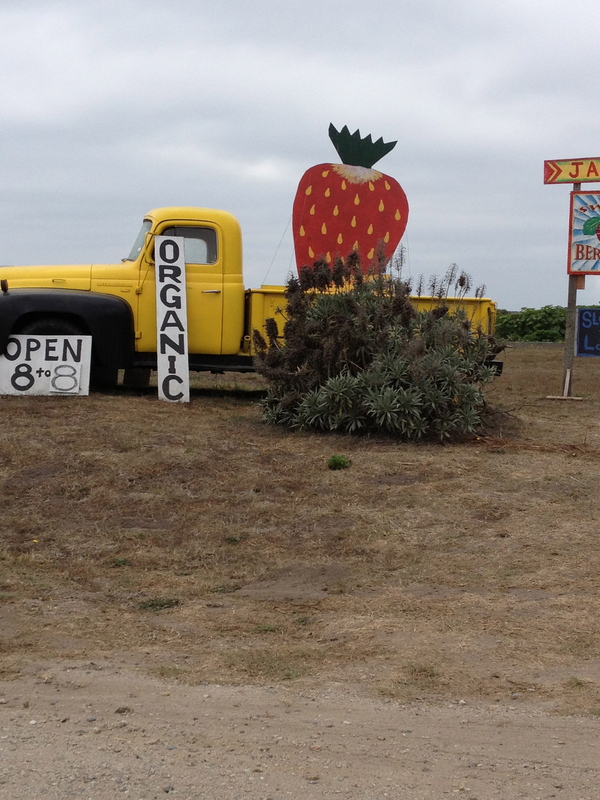 Some of my favorites were from an adorable berry farm off the coast of California. Hannah, Carrie and I were on our way to the airport and thought it would be neat to bring home some of the most delectable strawberries I ever met. 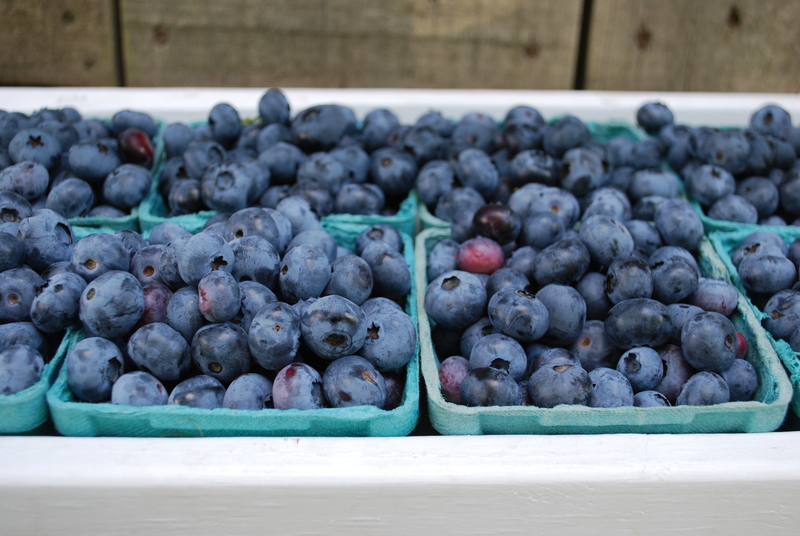 This specific farm picked the berries and sold them along with many scrumptious baked goods. 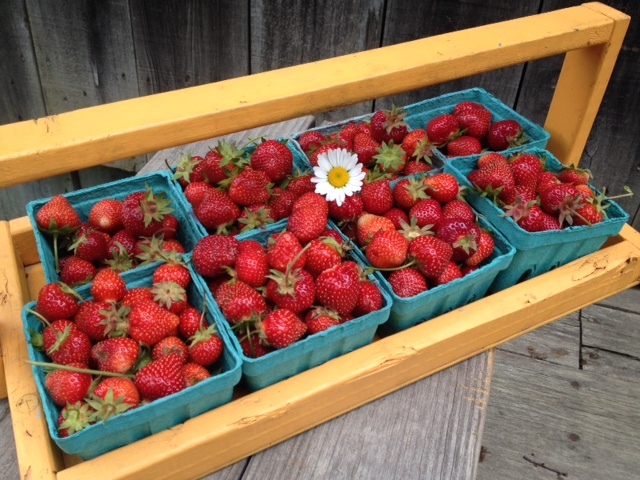 The strawberries were small, sweet and juicy and we bought a few pints. I was concerned we wouldn’t get the berries through airport security. There was no need to worry because Carrie ate most of them before we got to the airport! Love her! 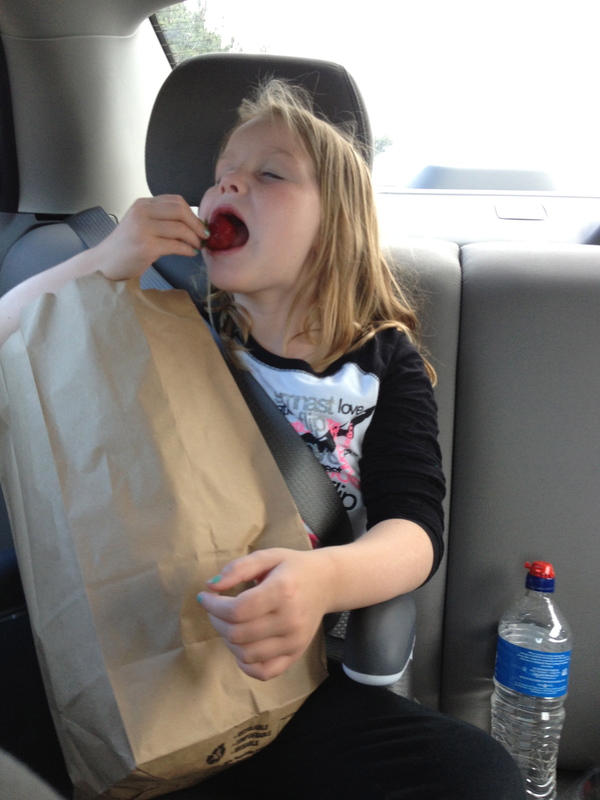 Carrie has always been crazy about strawberries. When she started talking, she couldn’t pronounce the word strawberries. What came out of her mouth was the most adorable word ever. “Dobbies.” Her sweet baby voice made that word a staple in our family vocabulary. We went through hundreds of bags of Trader Joe’s freeze-dried dobbies over the course of her toddler years. Carrie consumed tons of fresh dobbies as well, and asked for a dobbie cake for her fourth birthday. The days spent at my corporate job often had me dreaming about starting my own business; I always wanted to call it Dobbies. I changed my mind when we came up with Floured Apron, but have never stopped using the word dobbies in place of the word strawberries. 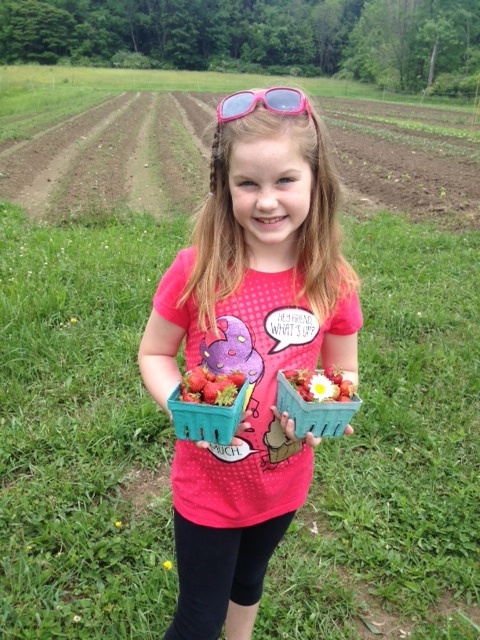 Since we’ve always had a thing for these succulent berries, it was awesome to have a chance to pick our own. Someone was very excited! My heart filled right up when I saw the joy in Carrie’s face and her delight in filling up her pint boxes. 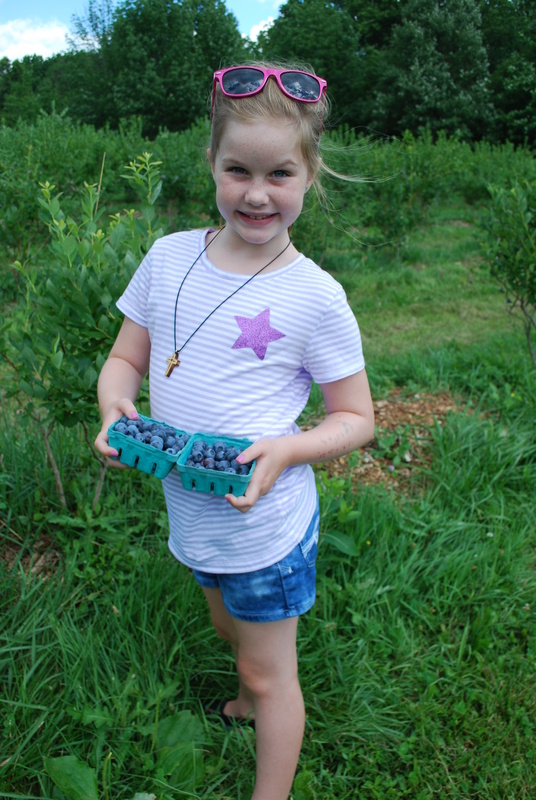 When I thought I couldn’t have a better day, the farm owner, Daniel, told us the blueberries would be ready in July! YAY! Fresh dobbies, pure fun, and a new-found farm all made for a perfect afternoon! I thought we’d come home and stuff ourselves full of dobbies, however, it was killing me not to make something with those fresh berries! Jam, pie or smoothies? I couldn’t let it go. Carrie has been asking me to make a cupcake named after me. 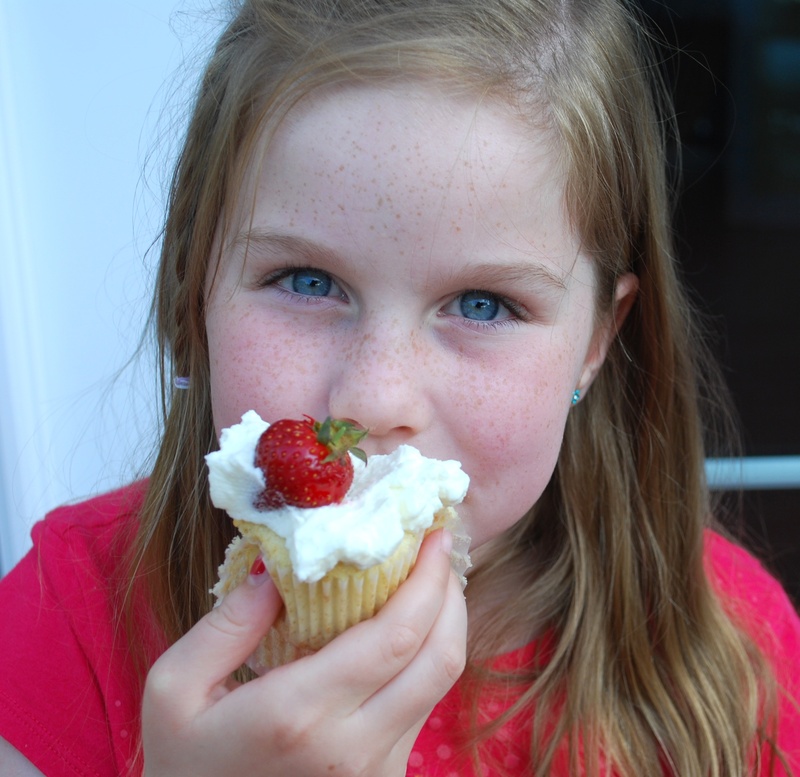 She thinks it’s a big deal that we have cupcakes named after her and Hannah on our menu. (Here’s the post on Carrie’s claim to fame cupcake.) 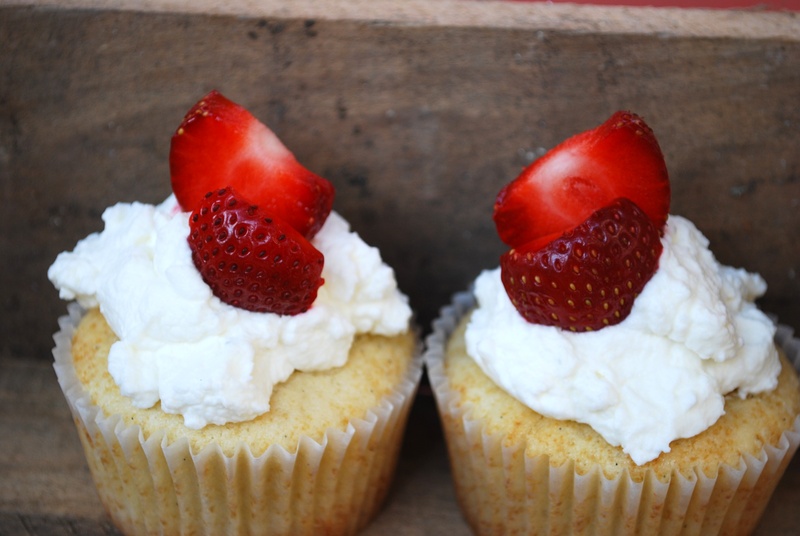 Carrie came up with Shannon’s Shortcake Cupcake a couple of months ago. I haven’t made shortcakes in years (instead, I’ve been banging my head against the counter with Macaron making attempts, but that’s another story). 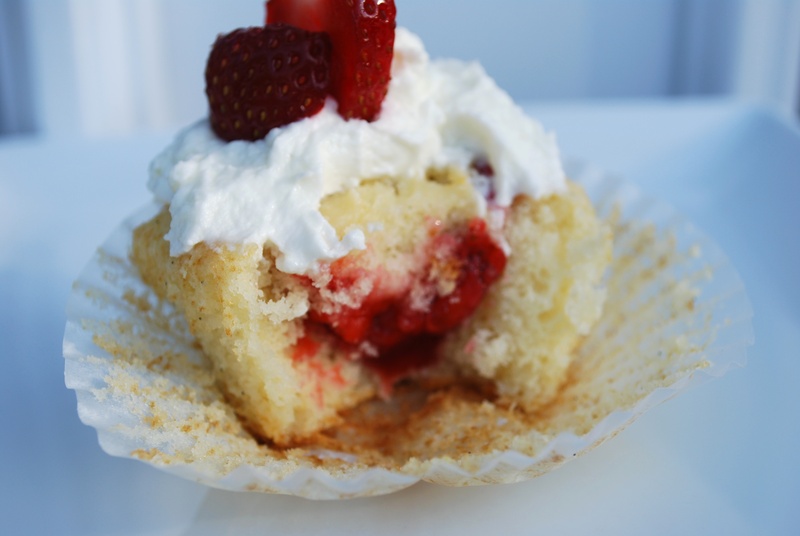 While she and Casey headed to the pond to fish, I decided it was the perfect time to make a Strawberry Shortcake Cupcake. I wanted this cupcake to represent all the things I love about traditional strawberry shortcake. I decided to start with my Vanilla Bean Cupcake. I thought about mixing some of the fresh berries into the batter but didn’t think that was enough of a dobbie punch. So, I ended up making a dobbie filling. I simply diced up some of the berries, cooked them in a pan, added a little sugar and cornstarch and let the mixture cook then cool. Looks good, huh? As soon as it cooled, I ate a big spoonful and had to stop myself or I was going to have to make another batch to fill the cupcakes! Once everything was cool, I cored the cupcakes and spooned as much of the filling inside as possible. 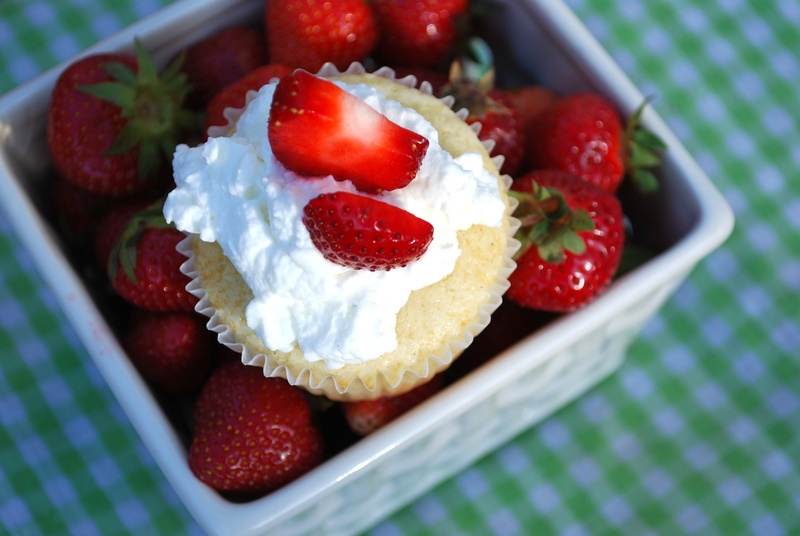 Let’s face it, all the components of strawberry shortcake are delicious. I have always been partial to the biscuit type shortcake and the sugar soaked berries on top with all the syrup running everywhere. Then there’s the whipped cream. 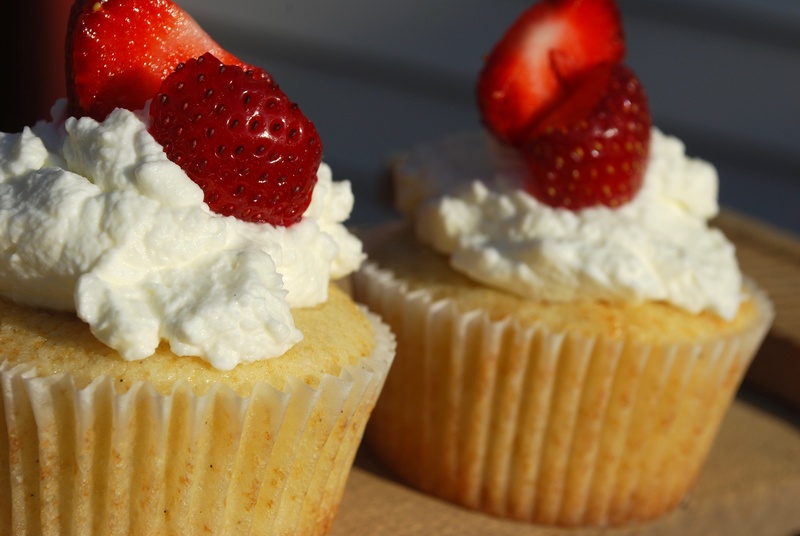 When I eat strawberry shortcake, I put whipped cream on top, eat it, add more, eat it…you get the idea. Whipped cream rules and I want some with every bite! I wanted these cupcakes on the lighter side so I walked away from all thoughts of buttercream frosting and topped them with generous dollops of, you guessed it, fresh whipped cream. I’m pretty sure I made the right decision! I can’t even find words to tell you how delicious these are. Not too sweet, light and just heavenly. They were gone in a minute and I don’t regret eating a single one (neither does Carrie)! 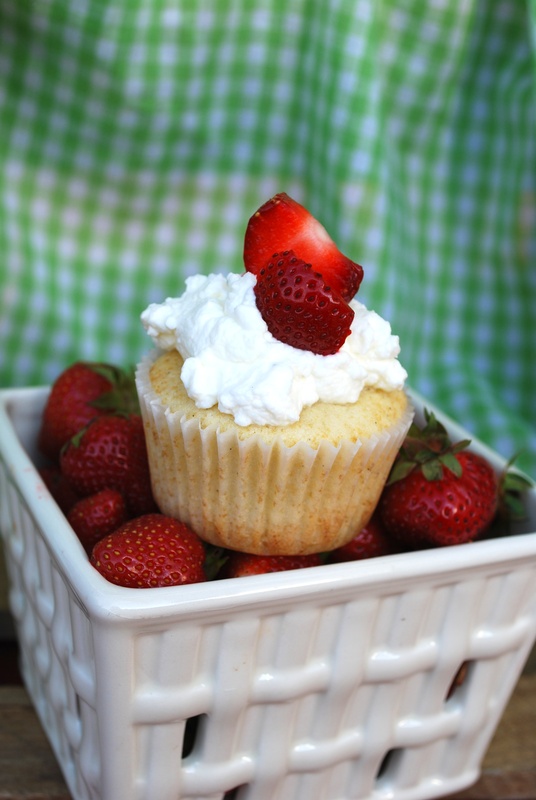 Carrie wants me to call this Shannon’s Shortcake Cupcake and add it to our seasonal menu. I don’t care what it’s called, I just want to eat these every single day! I feel fortunate to have several farms nearby and am thankful for the people who work hard to grow amazing food and share it with us. 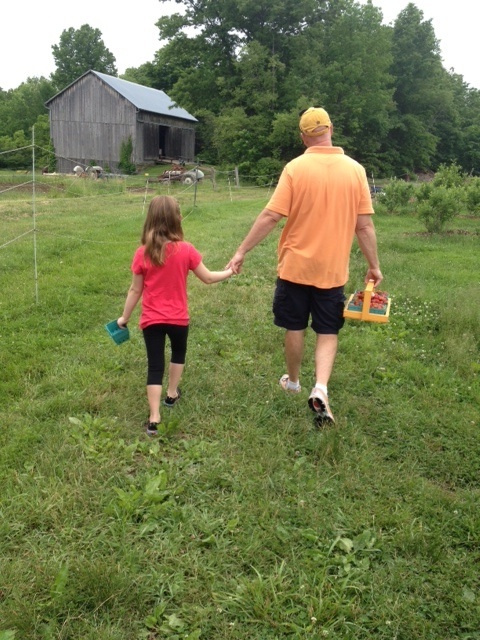 If you’ve never been to a local farm, I’d highly recommend finding one this summer. 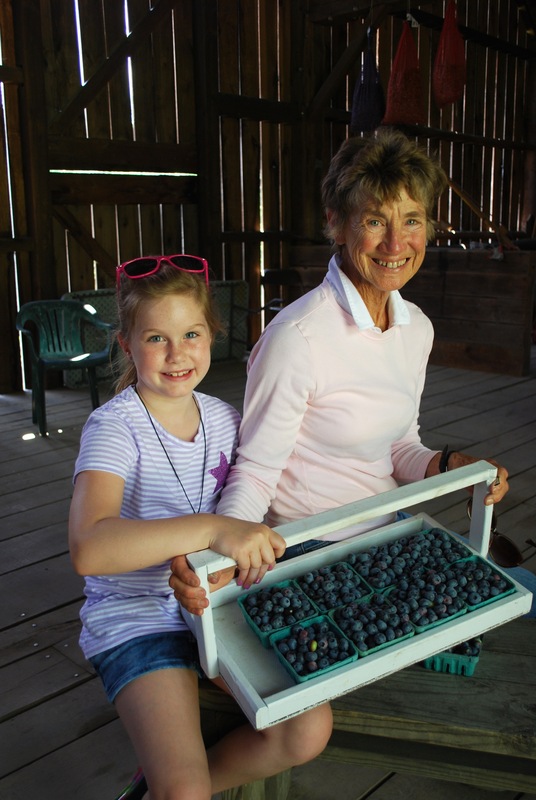 It’s a great experience for the whole family and farm owners are always happy to share their stories and crops. I enjoyed picking berries, watching Carrie pick berries, making a spectacular cupcake and reminiscing about when the word dobbies first came into our lives. You just never know where an unplanned day will take you! Today is Derby Day and what kind of Kentucky girl would I be if I didn’t make a Derby Day cupcake? Plus, I’m feeling a little homesick and I kind of need this cupcake for sheer comfort. That may be a slight stretch because you know I look for any excuse to make and eat cupcakes! I spent most of my younger days living on a farm in Kentucky. We owned several horses and had many fun times trail riding and many not so fun times cleaning stalls. We didn’t own thoroughbreds but we always gathered around the TV on Derby Day. I knew a little about thoroughbreds from a few trips I made to the Kentucky Horse Park. Additionally, I grew up in small town Walton, KY where jockey, Steve Cauthen, was proudly honored on our water tower: “Walton, KY Home of Steve Cauthen.” That was pretty cool! I’m, by no means, a thoroughbred or racetrack expert but I enjoy the Kentucky Derby and all the time-honored traditions that are part of race day. While many ladies have been selecting their magnificent Derby hats and the gents have been shining their shoes, I’ve been thinking about how to turn traditional Derby Pie into a cupcake. Someone has to do it! I didn’t feel the need to create this on my own as I was certain there were tons of recipes out there. Sure enough, my search resulted in lots of variations. Mine is a combination of a few recipes I found. Kentucky bourbon chocolate walnut pie is traditionally served at the annual Kentucky Derby horse race. Melrose Inn, located in Prospect, KY, is famous for their invention of Derby Pie in 1950. 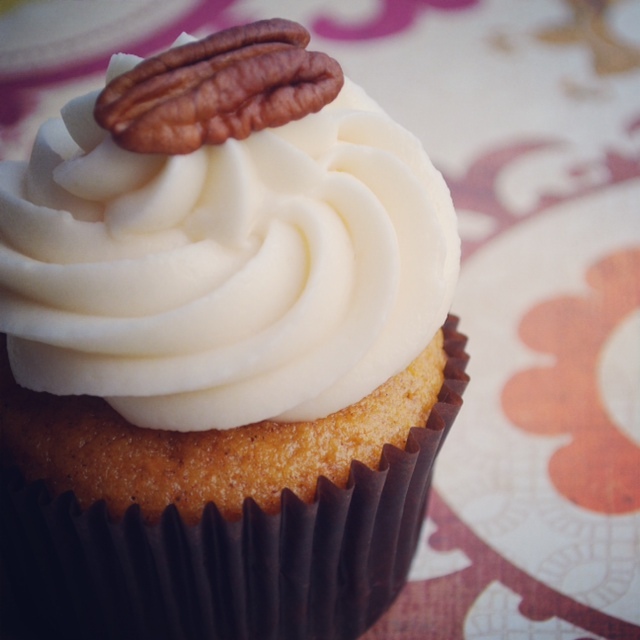 I reviewed several Derby Pie recipes and decided that bourbon, chocolate, walnuts and a little frosting would make for a fantastic cupcake! So, I got busy and put these together. 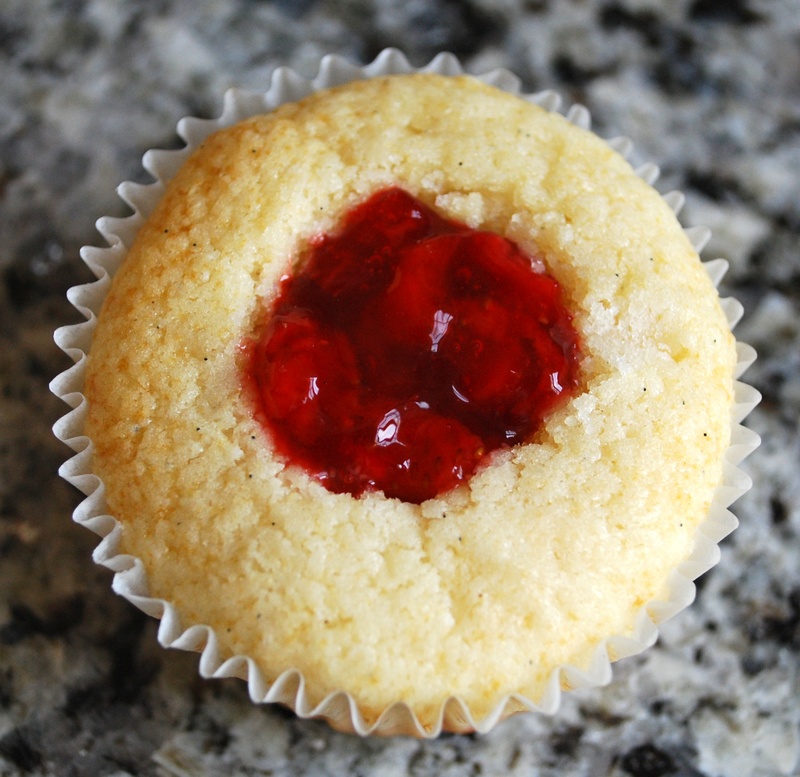 I’ve decided to add these to our menu for May and call them My Old Kentucky Home cupcakes. Something about these just feels like home. They are decadent and gooey. A key ingredient in these is bourbon. It’s in the cake, the frosting and the sticky glaze I drizzled on top. We usually have lots of bourbon on hand but the only bottle in our cabinet (obviously, it’s time to restock) was Corner Creek Reserve Bourbon made in Bardstown, KY. It smelled AMAZING as I added it to every part of the cupcake! I’m excited for the 140th Kentucky Derby! Do you have any Derby Day traditions? Perhaps you’re attending live and deciding if you want to place your bets on California Chrome, Dance with Fate or Wildcat Red. If you’re like me, you’ll be watching all the action from home. Whether you’re drinking Mint Juleps, wearing a fancy hat, eating Hot Brown and Derby Pie or just cheering on your favorite horse and jockey, have a grand time! I know I’ll be eating more of My Old Kentucky Home cupcakes while I eagerly await post time! Yee-haw!